Why you absolutely need to Winterize your Pool - Pool Daddy Pool Service, Maintenance, and Repair in Phoenix and Scottsdale, AZ. A lot of pool owners live in areas in which the temperatures stay fairly stable year round. Arizona is one of those states where you may not think to winterize your pool. However, it may be in your best interest to shut it down and winterize it for the offseason. Below we’ll talk about some reasons you may need to fully winterize your pool. If you don’t plan on using your pool year round, full pool winterization may be in order. If you plan on using your pool throughout Fall and Winter, you may be able to get by without fully shutting the pool down, and you do not have to drain it. Properly winterizing your pool reduces what you need to do weekly or monthly to keep it in working condition for the Spring or Summer. Here in the desert, it can get very cold (even rare below-freezing temperatures in some areas). Properly winterizing your pool will keep pipes from bursting or other problems from arising due to decreased temperatures once the sun goes down. If you’re only using your pool a few times throughout the off-season, you don’t need to be spending all of that time and money maintaining your pool. It’s up to you if the weekly maintenance, chemical testing, and cleaning are worth it to keep it open year round, but if you know the monthly cost of running your pool, you may want to close it for the months you won’t be using it. Most of the time, once a pool is winterized, you don’t have to think about it until you want to open it back up. It may be wise to check the levels periodically to make sure the pool winterization kit is doing the job. 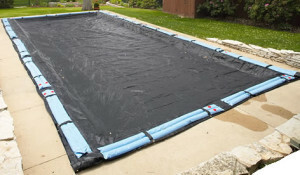 If you need your pool winterized this season, give us a call. Our team of professionals will get it done quickly and correctly so you can start focusing on Halloween, Thanksgiving, and Christmas. In the meantime, use your pool as often as you can, and don’t neglect it. We have weekly pool services available for all of our customers at affordable prices. We can work with above-ground and in-ground pools as well as spas, hot tubs , Jacuzzis, and more. Our services include cleaning, repair, installation of equipment, and more. If you have questions, concerns, requests, or require our services, don’t hesitate to call today. We’ll get your pool winterization up in working condition in no time so you can enjoy it every day. Our next post will discuss what to do if you want to keep your pool OPEN year round!